Manufacturer : Marion Power Shovel Co. of Ohio. The Saturn V launch vehicle was built in VAB(Vehicle Assembly Building) to protect it from rains, storms and salt breezes at KSC. Then it was carried to Launch pad by this huge Crawler Transporter. 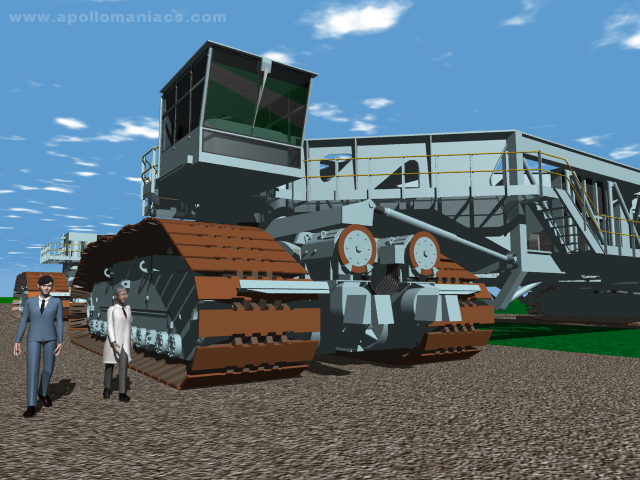 Along with this Crawler Transporter, using barge on canal, truck on rail were considered as the transfer method. 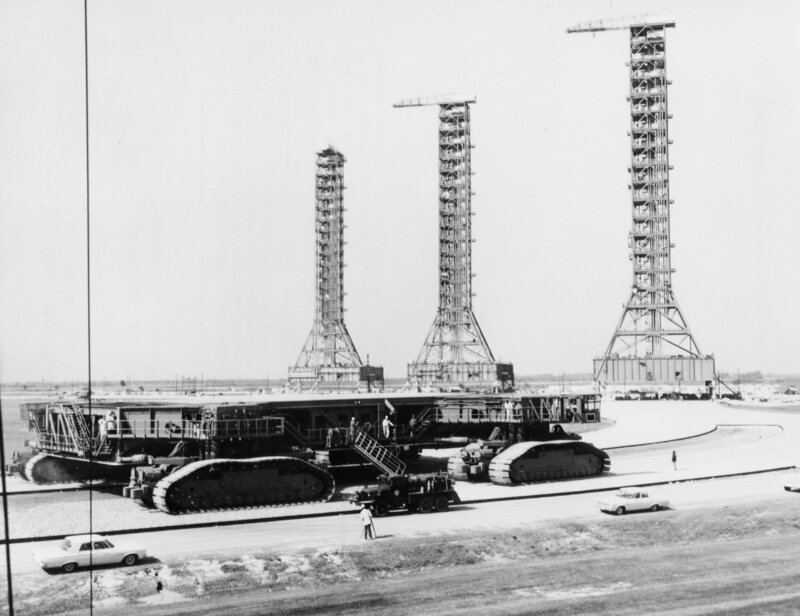 At first, the Crawler was planned as the integrated Transporter with Launch tower. But to minimize the time of repair after launch damage, the Crawler and the Launch tower were designed separately. 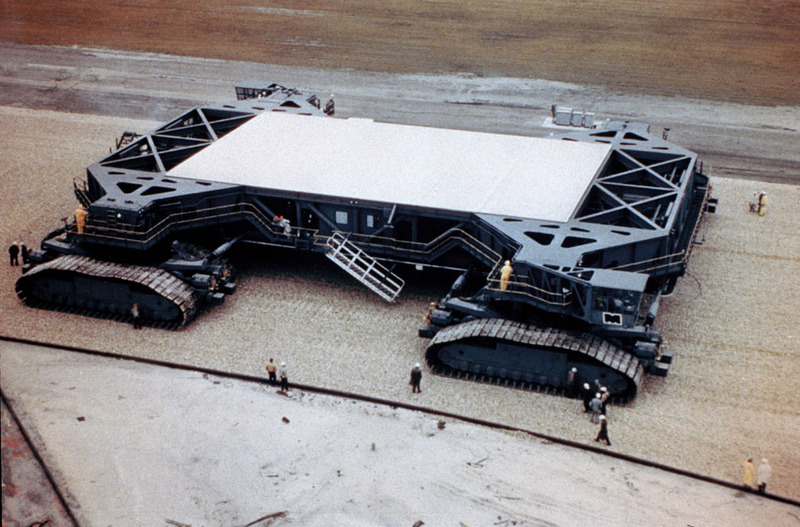 Fundamental designe was fixed at 1962, the first Crawler arrived on Merritt Island by 1 November 1964. 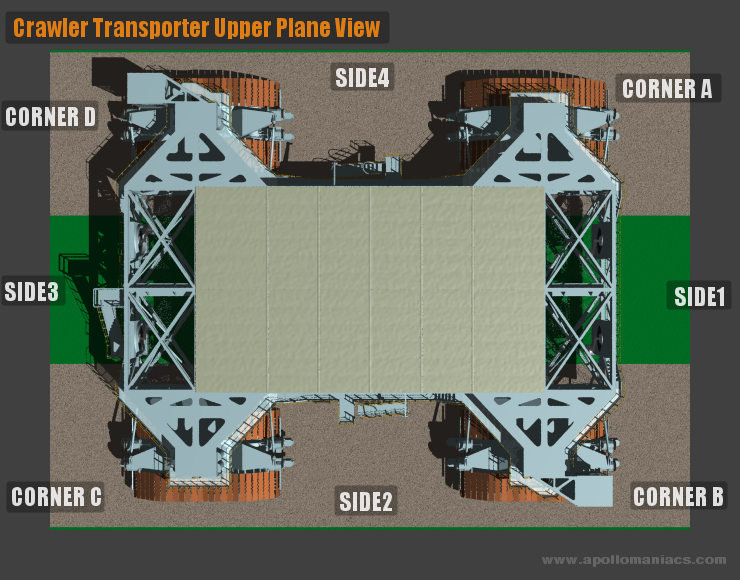 Finally two Crawler Transporters(CT) were delivered to NASA. One was called Hans, and the other was called Franz. It has the three stories building high, and eight lane highway width. The roof of it is flat, and the dimensions of it equals to baseball infield. 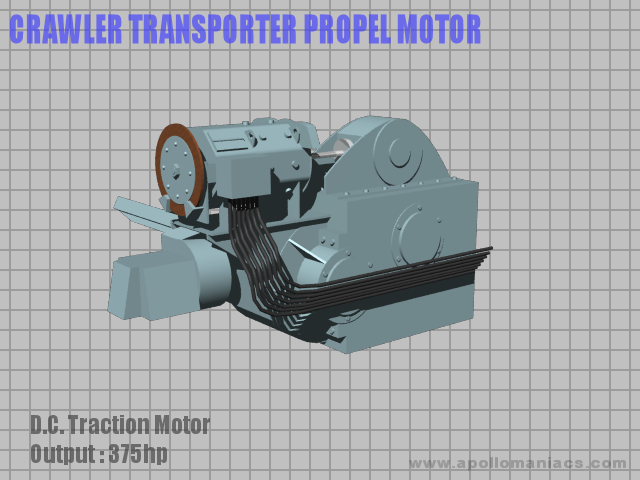 After the Apollo project, some modification were added for carrying Space Shuttle. 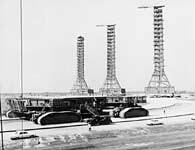 These Crawler Transporters are used for about 40 years without major modification. First the Crawler carries the Mobile Launcher(ML) to the VAB(Vehicle Assembly Building). 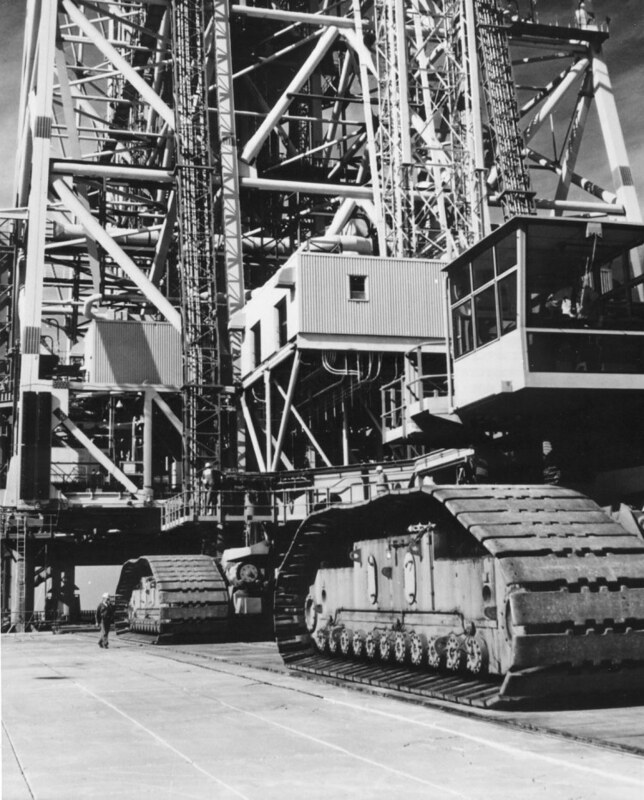 After the Saturn V launch vehicle was built on the ML, the Crawler carries the ML whth the rocket to LC-39 Launch pad. The ML was set on the pad stand faithfully by using Laser guidance system on the Crawler. Next the Crawler carries the Mobile Service Structure(MSS) to the pad for maintain the rocket. Just before the launch, the Crawler carries the MSS to it's parking area. And after the launch, the Crawler carries the ML to maintainance area near VAB. It takes five to eight hours to carry the ML from VAB to LC-39 launch pad with 11 crews. Distance from VAB to Pad A is approx. 3.5 miles, and to Pad B is approx. 4 miles. 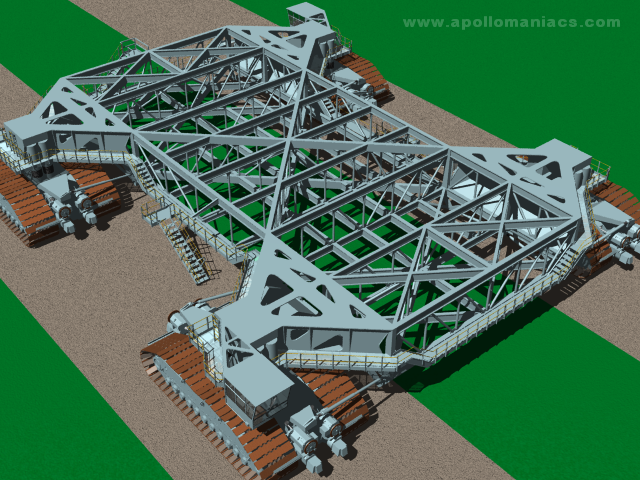 The body of the Crawler can slant plus-minus 10 arcminute to keep the rocket horizontally during climbing the 5% slope of the pad. Two operator's control cab are set on backward and forward. All systems are able to controll from this cab. 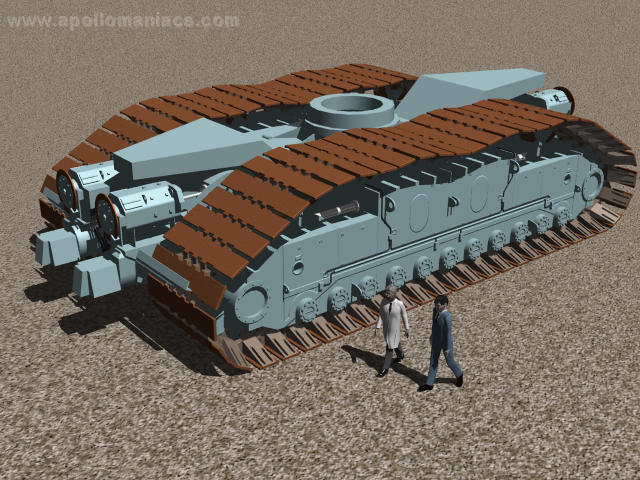 The body of the Crawler is on the four cleats. 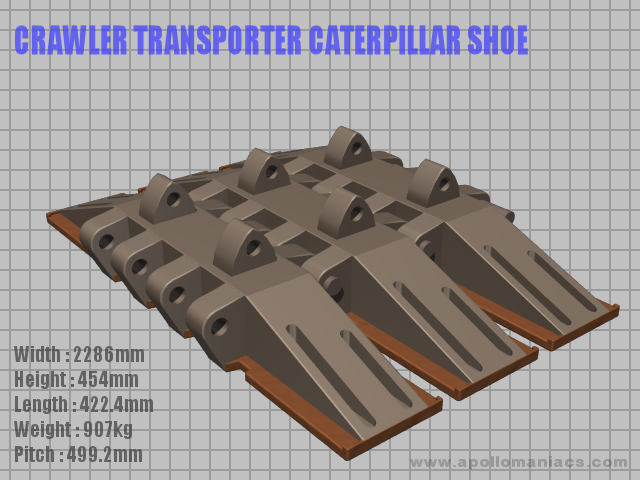 Each cleats has two tracks of caterpillar and it's size is 3 meters(10 ft) high, 12 meters(41 ft) length. Each caterpillar track consisted of 57 shoes. Each shoe's weight is 907kg. 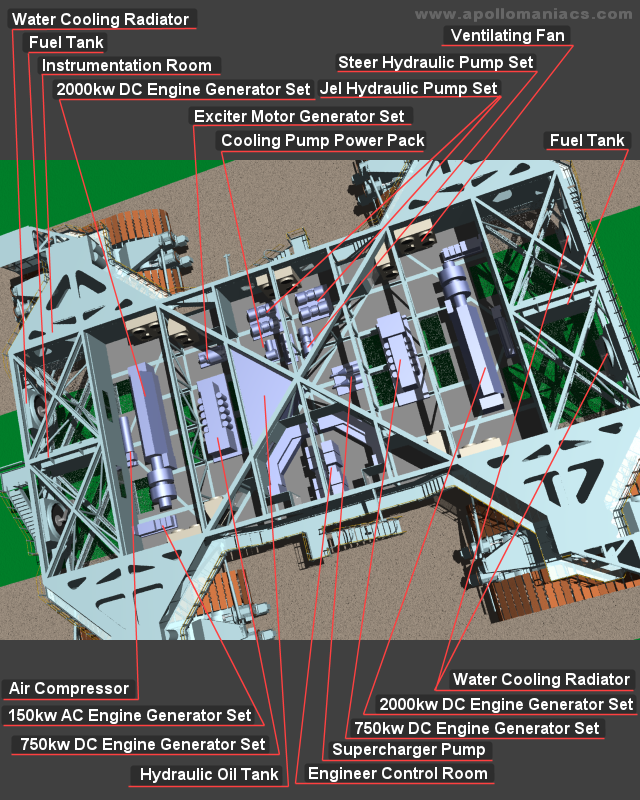 Four 1,000kw generator are driven by two 2,750hp 16 cylinders diesel engines. It's electric power are provided to 16 of 375hp D.C. traction motor. A.C. power for posture control(jack), steering, ventilation, lighting are provided by two 750 kw generator driven by two 1,065 hp diesel engines. Using this power, four hydraulic pumps drives steering system, and eight hydraulic pumps drives JEL(Jacking, Equalizing, Leveling) system. 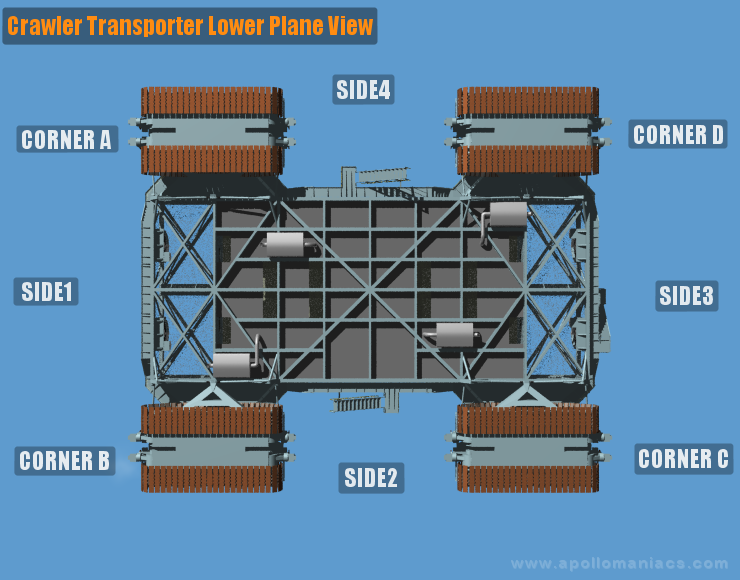 In addition, the Crawler carries two 150 kw generators for serving power to Saturn V Mobile Launcher(ML) (or Mobile Launch Platforms(MLP) of SpaceShuttle). The capacity of fuel tank is 5,000 gallons. At first, Marion Power Shovel Co. offered 8 million US dollars cost to NASA. But Marion finally completed the contract two years later, the price had risen above 14 million dollars. Because of their importance and cost, they were nicknamed, "Them Golden Slippers." from Save The LUT Campaign web site.